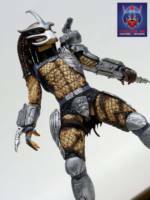 You are looking at a repainted NECA Enforcer Predator. This version has colorings more akin to P1. Customized a better disc holster as the factory one leaves much to be desired. 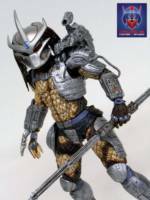 The Enforcer Predator appears in the Dark Horse comic PREDATOR: Bad Blood. He is dispatched to hunt down and stop a rogue bad blood on the loose in the new jersey pine barrens. What did you do to the holster? Swap one in from a Ghost Pred? Or custom rebuild? Cool! You are an expert when it comes to making the best looking Predators.